Dr. Charles L. Harris is the first in the area to offer the new micro pulse glaucoma laser MP 3 cyclo-photocoagulation treatment. This is a treatment for glaucoma that when drops are not enough you have an option that involves no invasive surgery and much safer than having surgery that goes inside the eye ( invasive surgery). MicroPulse allows the tissue to cool between laser pulses, minimizing or preventing tissue damage. Treatment risks are reduced or eliminated, with increased patient comfort than with conventional, continuous-wave laser treatment. We use laser surgery to treat numerous conditions such as diabetes, retinal tears, retinal detachments, retinal vein occlusions, glaucoma, macular degeneration, choroidal neovascularization, lattice degeneration,retinal holes and retinal neovascularization. First in the region to use a wide angle viewing system in vitreo-retinal surgery; Dr. Harris brought this technology with him from Atlanta in 2001 allowing quicker and safer surgery of the retina and macula including retinal detachments, macular holes, membranes and diabetic retinopathy. Dr. Harris is the first physician in Savannah to use Avastin to treat macular degeneration, retinal vein occlusions and macular edema from diabetes. First to use digital retinal angiography in the region: Dr. Harris started using digital angiography and fundus photography in Memphis in 1995. First to use, and the most experienced with, the combined high resolution scanning laser ophthalmoscope and optical coherence tomography system in the region; we can most accurately diagnose and treat retina,macula and optic nerve problems with this technology. This technology and experienced interpretation allows earlier detection and treatment of many retinal and macular disorders as well as optic nerve disorders such as glaucoma. Retinal problems can develop for a number of reasons, including injury, aging, heredity or inflammation. If you have diabetes, you are at increased risk for retinal problems. As the disease progresses, these vessels leak, causing swelling of the retina and vision loss. Or, if you have visible “floaters,” that could be a symptom of a retinal tear or possible bleeding. 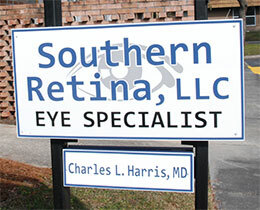 Thankfully, Dr. Harris can diagnose retinal problems in their early stages, when there are no outward symptoms. If surgery is needed, you’ll feel confident knowing that Dr. Harris is highly skilled in today’s most advanced laser and microsurgical techniques that can treat a variety of retinal disorders.